There are mentions in Medieval records of fleets commanded by Scottish kings including William the Lion and Alexander II. The latter took personal command of a large naval force which sailed from the Firth of Clyde and anchored off the island of Kerrera in 1249, intended to transport his army in a campaign against the Kingdom of the Isles, but he died before the campaign could begin. Viking naval power was disrupted by conflicts between the Scandinavian kingdoms, but entered a period of resurgence in the thirteenth century when Norwegian kings began to build some of the largest ships seen in Northern European waters. These included king Hakon Hakonsson's Kristsúðin, built at Bergen from 1262–63, which was 260 feet (79 m) long, of 37 rooms. In 1263 Hakon responded to Alexander III's designs on the Hebrides by personally leading a major fleet of forty vessels, including the Kristsúðin, to the islands, where they were swelled by local allies to as many as 200 ships. Records indicate that Alexander had several large oared ships built at Ayr, but he avoided a sea battle. Defeat on land at the Battle of Largs and winter storms forced the Norwegian fleet to return home, leaving the Scottish crown as the major power in the region and leading to the ceding of the Western Isles to Alexander in 1266. English naval power was vital to Edward I's successful campaigns in Scotland from 1296, using largely merchant ships from England, Ireland and his allies in the Islands to transport and supply his armies. Part of the reason for Robert I's success was his ability to call on naval forces from the Islands. As a result of the expulsion of the Flemings from England in 1303, he gained the support of a major naval power in the North Sea. The development of naval power allowed Robert to successfully defeat English attempts to capture him in the Highlands and Islands and to blockade major English controlled fortresses at Perth and Stirling, the last forcing Edward II to attempt the relief that resulted at English defeat at Bannockburn in 1314. Scottish naval forces allowed invasions of the Isle of Man in 1313 and 1317 and Ireland in 1315. They were also crucial in the blockade of Berwick, which led to its fall in 1318. After the establishment of Scottish independence, Robert I turned his attention to building up a Scottish naval capacity. This was largely focused on the west coast, with the Exchequer Rolls of 1326 recording the feudal duties of his vassals in that region to aid him with their vessels and crews. Towards the end of his reign he supervised the building of at least one royal man-of-war near his palace at Cardross on the River Clyde. In the late fourteenth century naval warfare with England was conducted largely by hired Scots, Flemish and French merchantmen and privateers. James I took a greater interest in naval power. After his return to Scotland in 1424, he established a shipbuilding yard at Leith, a house for marine stores, and a workshop. King's ships were built and equipped there to be used for trade as well as war, one of which accompanied him on his expedition to the Islands in 1429. The office of Lord High Admiral was probably founded in this period. In his struggles with his nobles in 1488 James III received assistance from his two warships the Flower and the King's Carvel also known as the Yellow Carvel. There were various attempts to create royal naval forces in the fifteenth century. James IV put the enterprise on a new footing, founding a harbour at Newhaven and a dockyard at the Pools of Airth. He acquired a total of 38 ships including the Great Michael, at that time, the largest ship in Europe. Scottish ships had some success against privateers, accompanied the king on his expeditions in the islands and intervened in conflicts Scandinavia and the Baltic, but were sold after the Flodden campaign and after 1516 and Scottish naval efforts would rely on privateering captains and hired merchantmen. James V did not share his father's interest in developing a navy and shipbuilding fell behind the Low Countries. Despite truces between England and Scotland there were periodic outbreaks of a guerre de course. James V built a new harbour at Burntisland in 1542. The chief use of naval power in his reign was a series of expeditions to the Isles and France. After the Union of Crowns in 1603 conflict between Scotland and England ended, but Scotland found itself involved in England's foreign policy, opening up Scottish shipping to attack. In 1626 a squadron of three ships were bought and equipped. There were also several marque fleets of privateers. In 1627, the Royal Scots Navy and accompanying contingents of burgh privateers participated in the major expedition to Biscay. The Scots also returned to West Indies and in 1629 took part in the capture of Quebec. During the Bishop's Wars the king attempted to blockade Scotland and planned amphibious assaults from England on the East coast and from Ireland to the West. Scottish privateers took a number of English prizes. After the Covenanters allied with the English Parliament they established two patrol squadrons for the Atlantic and North Sea coasts, known collectively as the "Scotch Guard". The Scottish navy was unable to withstand the English fleet that accompanied the army led by Cromwell that conquered Scotland in 1649-51 and the Scottish ships and crews were split up among the Commonwealth fleet. Scottish seamen received protection against arbitrary impressment by English men of war, but a fixed quota of conscripts for the Royal Navy was levied from the sea-coast burghs during the second half of the seventeenth century. Royal Navy patrols were now found in Scottish waters even in peacetime. In the Second (1665–67) and Third Anglo-Dutch Wars (1672–74) between 80 and 120 captains, took Scottish letters of marque and privateers played a major part in the naval conflict. In the 1690s a small fleet of five ships was established by merchants for the Darien Scheme, and a professional navy was established for the protection of commerce in home waters during the Nine Years' War, with three purpose-built warships bought from English shipbuilders in 1696. After the Act of Union in 1707, these vessels were transferred to the Royal Navy. Before the Wars of the Three Kingdoms in 1644, there was no standing army in the Kingdom of Scotland. In the Early Middle Ages war in Scotland was characterised by the use of small war-bands of household troops often engaging in raids and low level warfare. By the High Middle Ages, the kings of Scotland could command forces of tens of thousands of men for short periods as part of the "common army", mainly of poorly armoured spear and bowmen. After the "Davidian Revolution" of the 12th century, which introduced elements of feudalism to Scotland, these forces were augmented by small numbers of mounted and heavily armoured knights. These armies rarely managed to stand up to the usually larger and more professional armies produced by England, but they were used to good effect by Robert I of Scotland at Battle of Bannockburn in 1314 to secure Scottish independence. After the Wars of Scottish Independence, the Auld Alliance between Scotland and France played a large part in the country's military activities, especially during the Hundred Years' War. In the Late Middle Ages under the Stewart kings forces were further augmented by specialist troops, particularly men-at-arms and archers, hired by bonds of manrent, similar to English indentures of the same period. Archers became much sought after as mercenaries in French armies of the 15th century in order to help counter the English superiority in this arm, becoming a major element of the French royal guards as the Garde Écossaise. The Stewarts also adopted major innovations in continental warfare, such as longer pikes and the extensive use of artillery. However, in the early 16th century one of the best armed and largest Scottish armies ever assembled still met with defeat at the hands of an English army at the Battle of Flodden in 1513, which saw the destruction of a large number of ordinary troops, a large section of the nobility and the king James IV. In the sixteenth century the crown took an increasing role in the supply of military equipment. The pike began to replace the spear and the Scots began to convert from the bow to gunpowder firearms. The feudal heavy cavalry had begun to disappear from Scottish armies and the Scots fielded relatively large numbers of light horse, often drawn from the borders. James IV brought in experts from France, Germany and the Netherlands and established a gun foundry in 1511. In the early seventeenth century relatively large numbers of Scots took service in foreign armies involved in the Thirty Years' War. As armed conflict with Charles I in the Bishop's Wars became likely, hundreds of Scots mercenaries returned home from foreign service, including experienced leaders like Alexander and David Leslie and these veterans played an important role in training recruits. These systems would form the basis of the Covenanter armies that intervened in the Civil Wars in England and Ireland. Scottish infantry were generally armed, as was almost universal in Western Europe, with a combination of pike and shot. Scottish armies may also have had individuals with a variety of weapons including bows, Lochaber axes, and halberds. Most cavalry were probably equipped with pistols and swords, although there is some evidence that they included lancers. Royalist armies, like those led by James Graham, Marquis of Montrose (1643–44) and in Glencairn's rising (1653–54), were mainly composed of conventionally armed infantry with pike and shot. Montrose's forces were short of heavy artillery suitable for siege warfare and had only a small force of cavalry. At the Restoration the Privy Council established a force of several infantry regiments and a few troops of horse and there were attempts to found a national militia on the English model. The standing army was mainly employed in the suppression of Covenanter rebellions and the guerrilla war undertaken by the Cameronians in the East. Pikemen became less important in the late seventeenth century and after the introduction of the socket bayonet disappeared altogether, while matchlock muskets were replaced by the more reliable flintlock. On the eve of the Glorious Revolution the standing army in Scotland was about 3,000 men in various regiments and another 268 veterans in the major garrison towns. After the Glorious Revolution the Scots were drawn into King William II's continental wars, beginning with the Nine Years' War in Flanders (1689–97). By the time of the Act of Union, the Kingdom of Scotland had a standing army of seven units of infantry, two of horse and one troop of Horse Guards, besides varying levels of fortress artillery in the garrison castles of Edinburgh, Dumbarton, and Stirling. Castles arrived in Scotland with the introduction of feudalism in the twelfth century. Initially these were wooden motte-and-bailey constructions, but many were replaced by stone castles with a high curtain wall. During the Wars of Independence, Robert the Bruce pursued a policy of castle slighting. In the late Middle Ages new castles were built, some on a grander scale as "livery and maintenance" castles that could support a large garrison. Gunpowder weaponry led to the use of gun ports, platforms to mount guns and walls adapted to resist bombardment. Many of the late Medieval castles built in the borders were in the form of tower houses, smaller pele towers or simpler bastle houses. From the fifteenth century there was a phase of Renaissance palace building, which restructured them as castle-type palaces, beginning at Linlithgow. Elements of Medieval castles, royal palaces and tower houses were used in the construction of Scots baronial estate houses, which were built largely for comfort, but with a castle-like appearance. In the seventeenth and eighteenth centuries the military significance of castles declined, but they increasingly became tourist attractions. Elements of the Scots Baronial style would be revived from the late eighteenth century and the trend would be confirmed in popularity by the rebuilding of Balmoral Castle in the nineteenth century and its adoption as a retreat by Queen Victoria. In the twentieth century there were only isolated examples of new castle-influenced houses. After the Act of Union in 1707, the Scottish Army and Navy merged with those of England. The new British Army incorporated existing Scottish regiments, such as the Scots Guards (Marquis of Argyll's Royal Regiment), The Royal Scots 1st of Foot (Royal Regiment of Foot), King's Own Scottish Borderers 25th of Foot (Leven's Regiment), The 26th (Cameronian) Regiment of Foot (The Earl of Angus's Regiment), Scots Greys (Scots Dragoons) and the Royal Scots Fusiliers 21st of Foot (Earl of Mar's Regiment of Foot). The three vessels of the small Royal Scottish Navy were transferred to the Royal Navy (Royal William, a fifth-rate 32-gun frigate, became HMS Edinburgh; Royal Mary, a sixth-rate 24 gun frigate, became HMS Glasgow; Dumbarton Castle, a sixth-rate frigate, became HMS Dumbarton Castle). The new Armed Forces were controlled by the War Office and Admiralty from London. From the mid-eighteenth century the British Army began to recruit relatively large numbers of Highlanders. The first official Highland regiment to be raised for the British army was the Black Watch in 1740, but the growth of Highland regiments was delayed by the 1745 Jacobite Rebellion. During this period, Scottish soldiers and sailors were instrumental in supporting the expansion of the British Empire and became involved in many international conflicts. These included the War of the Spanish Succession (1702–13), the Quadruple Alliance (1718-20), the War of the Austrian Succession (1740–48), the Seven Years' War (1756-63) and the American Wars of Independence (1775–83). Admiral Sir Charles (John) Napier. Admiral Adam Duncan, 1st Viscount Duncan of Camperdown, led the Royal Navy fleet that defeated the Dutch at the Battle of Camperdown on 11 October 1797. Admiral Thomas Cochrane, 10th Earl of Dundonald, was one of the most daring and successful captains of the Napoleonic Wars, leading the French to nickname him "le loup de mer" ("the sea wolf"). After being dismissed from the Royal Navy, he served in the rebel navies of Chile, Brazil and Greece during their wars of independence, before being reinstated as an admiral in the Royal Navy. His life and exploits were one of the inspirations for the twentieth-century novelists C. S. Forester's Horatio Hornblower and Patrick O'Brian's Jack Aubrey. Thomas Graham, 1st Baron Lynedoch. George Ramsay, 9th Earl of Dalhousie. Field Marshal Sir Douglas Haig led the British Army on the Western Front from 1915, and oversaw some of the largest and bloodiest episodes of the war. Battles included the Somme(1916) Ypres (1917) Cambrai (1917) Amiens (1918) and Arras (1918) Due to the kilts worn by the Scottish soldiers on the World War I battlefront, their German enemies called them the "ladies from hell". Haig founded the Earl Haig Poppy Fund, for ex-servicemen in the aftermath. According to the historian T C Smout, "It is still not known how many Scots died in the war. One well-argued estimate put the figure at 110,000, equivalent to about 10 percent of the Scottish male population aged between sixteen and fifty, and probably to about 15 per cent of total British war dead — the sacrifice was higher in proportionate terms than for any other country in the Empire." In the wake of the Jacobite risings, several fortresses were built throughout the Highlands in the 18th century by General Wade in order to pacify the region, including Fort George, Fort Augustus and Fort William. The Ordnance Survey was also commissioned to map the region. Later, due to their topography and perceived remoteness, parts of Scotland have housed many sensitive defence establishments, some controversial. During World War II, Allied and British Commandos trained at Achnacarry in the Highlands and the island of Gruinard was used for an exercise in biological warfare. Regular British Army Garrisons currently operational in Scotland are: Fort George near Inverness; Redford Barracks and Dreghorn Barracks in Edinburgh; and Glencorse Barracks at Penicuik. Between 1960 and 1991, the Holy Loch was a base for the US Navy's fleet of Polaris-armed George Washington class ballistic missile submarines. Today, HM Naval Base Clyde, 25 miles (40 km) west of Glasgow, is the base for the four Trident-armed Vanguard class ballistic missile submarines which are armed with approximately 200 Trident nuclear warheads. Since the decommissioning of free-falling bombs in 1998, the Trident SLBM system is the UK's only nuclear deterrent. HMS Caledonia at Rosyth in Fife is the support base for navy operations in Scotland and also serves as the Naval Regional Office (NRO Scotland and Northern Ireland). The Royal Navy's LR5 and Submarine Rescue Service is based in Renfrew, near Glasgow. The Royal Navy's submarine nuclear reactor development establishment, is located at Vulcan NTRE, adjacent to Dounreay, which was the site of the UK's fast breeder nuclear reactor programme. RM Condor at Arbroath, Angus is home to 45 Commando, Royal Marines, part of 3 Commando Brigade. Also, the Fleet Protection Group Royal Marines is based at HMNB Clyde. Since 1999, the Scottish Government has had devolved responsibility over fisheries protection duties in Scotland's Exclusive Economic Zone, carried out by the Scottish Fisheries Protection Agency, which consists of a fleet of four Offshore Patrol Vessels and two Cessna 406 maritime patrol aircraft. A single front-line Royal Air Force station is located in Scotland. RAF Lossiemouth, located in Moray, is the RAF's northern QRA(I) base, supported by 3 Squadrons of Typhoons, and is also home to a squadron of Tornado. The only open air live depleted uranium weapons test range in the British Isles is located near Dundrennan. As a result, over 7000 weakly radioactive munitions lie on the seabed of the Solway Firth. In 2007, the MoD land holdings in Scotland (owned, leased or with legal rights) was 1,153 km2 representing 31.5% of the MoD's British estate. Prominent Training Areas include Garelochhead, Cape Wrath, Barry Buddon, The Army Selection and Development Center in Penicuik, and Castlelaw in the Pentland Hills. The bulk of the Royal Navy's surface fleet, such the Type 45 Destroyer HMS Daring, is designed and built by BAE Systems Surface Ships in Glasgow. Although diminished from its early 20th century heights, Glasgow remains the hub of the UK's Shipbuilding industry. Defence contractors and related companies employ around 30,000 people in Scotland and form an important part of the economy. The principal companies operating in the country include: BAE Systems, Rolls-Royce, Raytheon, Thales and Babcock. ^ a b P. F. Tytler, History of Scotland, Volume 2 (London: Black, 1829), pp. 309-10. ^ N. A. M. Rodger, The Safeguard of the Sea: A Naval History of Britain 660-1649 (London: Penguin UK, 2004), ISBN 0-14-191257-X, pp. 74-5. ^ P. J. Potter, Gothic Kings of Britain: the Lives of 31 Medieval Rulers, 1016–1399 (Jefferson, North Carolina: McFarland, 2008), ISBN 0-7864-4038-4, p. 157. ^ a b c d N. A. M. Rodger, The Safeguard of the Sea: A Naval History of Britain. Volume One 660-1649 (London: Harper, 1997) pp. 74-90. ^ a b c d J. Grant, "The Old Scots Navy from 1689 to 1710", Publications of the Navy Records Society, 44 (London: Navy Records Society, 1913-4), pp. i-xii. ^ N. Macdougall, James IV (Tuckwell, 1997), p. 235. ^ a b S. Murdoch, The Terror of the Seas? : Scottish Maritime Warfare, 1513–1713 (Leiden: Brill, 2010), ISBN 90-04-18568-2, pp. 33-4. ^ J. E. A. Dawson, Scotland Re-Formed, 1488–1587 (Edinburgh: Edinburgh University Press, 2007), ISBN 0748614559, pp. 181-2. ^ S. Murdoch, The Terror of the Seas? : Scottish Maritime Warfare 1513–1713 (Leiden: Brill, 2010), ISBN 9004185682, p. 39. ^ T. Andrea, The Princelie Majestie: The Court of James V of Scotland 1528–1542 (Birlinn, 2005), p. 164. ^ a b J. E. A. Dawson, Scotland Re-Formed, 1488–1587 (Edinburgh: Edinburgh University Press, 2007), ISBN 0-7486-1455-9, p. 76. ^ S. Murdoch, The Terror of the Seas? : Scottish Maritime Warfare, 1513–1713 (Leiden: Brill, 2010), ISBN 90-04-18568-2, p. 172. ^ a b J. S. Wheeler, The Irish and British Wars, 1637–1654: Triumph, Tragedy, and Failure (London: Routledge, 2002), ISBN 0415221315, pp. 19-21. ^ S. Murdoch, The Terror of the Seas? : Scottish Maritime Warfare, 1513–1713 (Leiden: Brill, 2010), ISBN 90-04-18568-2, p. 198. ^ S. Murdoch, The Terror of the Seas? : Scottish Maritime Warfare, 1513–1713 (Leiden: Brill, 2010), ISBN 90-04-18568-2, pp. 204-10. ^ S. Murdoch, The Terror of the Seas? : Scottish Maritime Warfare 1513–1713 (Leiden: Brill, 2010), ISBN 9004185682, p. 239. ^ A.Campbell, A History of Clan Campbell: From The Restoration To The Present Day (Edinburgh: Edinburgh University Press, 2004), ISBN 0748617906, p. 44. ^ S. Murdoch, The Terror of the Seas? : Scottish Maritime Warfare 1513–1713 (Leiden: Brill, 2010), ISBN 9004185682, pp. 239-41. ^ M. Brown, Bannockburn: the Scottish War and the British Isles, 1307–1323 (Edinburgh: Edinburgh University Press, 2008), ISBN 0-7486-3333-2, pp. 95-9. ^ P. Contamine, "Scottish soldiers in France in the second half of the 15th century: mercenaries, immigrants, or Frenchmen in the making?" in G. G. Simpson, ed., The Scottish Soldier Abroad, 1247–1967 (Edinburgh: Rowman & Littlefield, 1992), ISBN 0-85976-341-2, pp. 16-30. ^ G. Phillips, The Anglo-Scots Wars, 1513–1550: A Military History (Woodbridge: Boydell Press, 1999), ISBN 0851157467, p. 68. ^ G. Phillips, The Anglo-Scots Wars, 1513–1550: A Military History (Woodbridge: Boydell Press, 1999), ISBN 0851157467, pp. 69-70. ^ R. Mitchison, A History of Scotland (London: Routledge, 3rd edn., 2002), ISBN 0415278805, p. 183. ^ J. Barratt, Cavalier Generals: King Charles I and his Commanders in the English Civil War, 1642-46 (Pen & Sword Military, 2004), ISBN 184415128X, p. 169. ^ a b c E. M. Furgol, "Warfare, weapons and fortifications: 3 1600–1700" in M. Lynch, ed., The Oxford Companion to Scottish History (Oxford: Oxford University Press, 2001), ISBN 0-19-211696-7, pp. 637-8. ^ J. Young, "Army: 1600–1750" in M. Lynch, ed., The Oxford Companion to Scottish History (Oxford: Oxford University Press, 2001), ISBN 0-19-211696-7, pp. 24-5. ^ Leask, Anthony (2006). Sword of Scotland: Our Fighting Jocks. Pen and Sword Books Limited. p. 85. ISBN 184415405X. ^ G. G. Simpson and B. Webster, "Charter Evidence and the Distribution of Mottes in Scotland", in R. Liddiard, ed., Anglo-Norman Castles (Woodbridge: Boydell Press, 2003), ISBN 978-0-85115-904-1, p. 225. ^ T. W. West, Discovering Scottish Architecture (Botley: Osprey, 1985), ISBN 0-85263-748-9, p. 21. ^ a b T. W. West, Discovering Scottish Architecture (Botley: Osprey, 1985), ISBN 0-85263-748-9, p. 26. ^ J. S. Hamilton, The Plantagenets: History of a Dynasty (London: Continuum, 2010), ISBN 1-4411-5712-3, p. 116. ^ M. Glendinning, R. MacInnes and A. MacKechnie, A History of Scottish Architecture: From the Renaissance to the Present Day (Edinburgh: Edinburgh University Press, 1996), ISBN 0-7486-0849-4, p. 16. ^ J. Summerson, Architecture in Britain, 1530 to 1830 (New Haven, Connecticut: Yale University Press, 9th edn., 1993), ISBN 0-300-05886-1, pp. 502–11. ^ J. Summerson, Architecture in Britain, 1530 to 1830 (New Haven, Connecticut: Yale University Press, 9th edn., 1993), ISBN 0-300-05886-1, p. 502. ^ I. D. Whyte, and K. A. Whyte, The Changing Scottish Landscape, 1500–1800 (London: Routledge, 1991), ISBN 978-0-415-02992-6, p. 77. 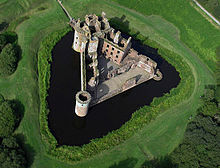 ^ S. Reid, Castles and Tower Houses of the Scottish Clans, 1450–1650 (Botley: Osprey, 2006), ISBN 1-84176-962-2, p. 57. ^ K. H. Grenier, Tourism and Identity in Scotland, 1770–1914: Creating Caledonia (Aldershot: Ashgate, 2005), ISBN 978-0-7546-3694-6, pp. 19 and 152. ^ A. Jackson, The Two Unions: Ireland, Scotland, and the Survival of the United Kingdom, 1707–2007 (Oxford: Oxford University Press, 2011), ISBN 0-19-959399-X, p. 152. ^ H.-R. Hitchcock, Architecture: Nineteenth and Twentieth Centuries (New Haven, Connecticut: Yale University Press, 4th edn., 1989), ISBN 0-300-05320-7, p. 146. ^ D. Mays, "Housing: 4 Country seat, c. 1600–Present", in M. Lynch, ed., Oxford Companion to Scottish History (Oxford: Oxford University Press, 2011), ISBN 0-19-969305-6, pp. 326–8. ^ A. Mackillop, "Highland Regiments 1750–1830" in M. Lynch, ed., The Oxford Companion to Scottish History (Oxford: Oxford University Press, 2001), ISBN 0-19-211696-7, pp. 25-6. ^ "Ladies From Hell, Chicago Chapter". 28 July 2009. Archived from the original on 28 July 2009. Retrieved 18 December 2011. ^ UK Defence Statistics, 2005 "Archived copy". Archived from the original on 14 June 2008. Retrieved 15 November 2007. CS1 maint: Archived copy as title (link). Kenyon, John, and Jane Ohlmeyer. The British and Irish Civil Wars: A Military History of Scotland, Ireland, and England, 1638–1660 (1998). Spiers, Edward M. The Scottish Soldier and Empire, 1854–1902 (Edinburgh University Press, 2006). This page was last edited on 5 December 2018, at 22:39 (UTC).